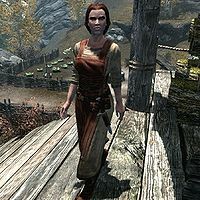 Temba Wide-Arm is a Nord citizen of Ivarstead who owns the town's sawmill. She fears losing her sawmill due to bears, claiming that they scratch trees with their claws therefore degrading the quality of the wood. This forces her to spend time looking for unharmed trees further and further away from Ivarstead. Because of this, she will offer you a reward if you bring her ten bear pelts. She also becomes a potential candidate for marriage after either bringing her the pelts or selling wood to her. With all the problems she is having with the local bears, Temba must now dedicate most of her time to running the mill in order to try and stay in business. She begins her day by waking up inside the Vilemyr Inn at 5am and having a one-hour breakfast inside the inn. She leaves the inn at 6am to head to her sawmill located in the northern part of Ivarstead. She will work here for the next ten hours, loading logs for the mill to chop. At 4pm, she takes a break by heading back to the inn to have a one-hour dinner. After she finishes her meal, she leaves the inn at 5pm to head back to the mill to work for another three hours. After a long work day, Temba leaves the mill at 8pm to head to the inn where she will relax for the next four hours before heading to bed at midnight. Temba wears a set of merchant clothes and a pair of boots. She is equipped with a leveled dagger which can be up to elven quality, and carries a belted tunic along with a selection of common items and gold. When you first approach her, Temba will immediately begin to talk about her bear problems: "This has to be the worst place in Skyrim to run a mill. How am I supposed to do anything with all those bears running around?" and "These damn bears are driving me crazy!" She will also talk about the destruction they have caused: "Can you believe it? Another pile of logs ruined." She does not seem to be coping with the added stress to her life created by the bears, as she will often say: "I swear, if one more thing goes wrong, I'm going to burn my mill to the ground!" If you ask her about what's making her so angry, she will provide you with a list of problems in her life: "My business is falling apart, my apprentice never listens to me and now there's talk of dragons. If I hadn't sunk every bit of gold I had into my mill, I would have picked up and left Ivarstead long ago." If you ask her if there is anything she can tell you about High Hrothgar, she will express little interest in the topic and simply remark: "The Greybeards stay away from me, and I stay away from them. Suits me just fine." At this point, she will bid you farewell with: "Just get out of my way, I've got work to do." Should you ask Temba if she has a bear problem, she will provide you with a task to bring her ten bear pelts: "Are you kidding? Those damn things will drive me right out of business! Tell you what. Bring me ten of their pelts from anywhere in Skyrim I'll gladly pay you for thinning out the herd." You can now ask her how bears could run her out of business, to which she will explain the effect bears have on trees: "Have you ever seen what a bear does to the trees? They jump up on their hind legs and scratch them to bits... marking their territory or something. It's getting to the point where I have to scour Skyrim for untouched trees at the right size. Costs me too much time and money." She will now end conversation with a reminder: "Now go give those stupid bears what's coming to them!" Gwilin, Temba's apprentice at the mill, will be optimistic that you can do something to solve her bear problem: "Those bears are making Miss Temba so angry. I hope you can do something about them." Once you have received this task from Temba, she may greet you with: "So, have you shown those furry menaces that I mean business?" If you have the pelts and tell her that you have brought them just as she asked, she will bluntly thank you for completing her task and reward you for your efforts: "Nice to finally meet someone who can follow simple instructions. Here's your reward, as promised. Now if you'll excuse me, I have to get back to work." After giving her the pelts, Temba may now greet you with: "I'm going to put those pelts you gave me to good use." She will also bid farewell by asking you for a favor: "If you get a chance, kill a few more bears for me, will you?" Gwilin will also be happy that you helped Temba with her bear problem, and will tell you that she is a little less angry now: "Miss Temba is much happier now that you took care of those bears. She may not look like she is, but I can tell." Temba: "Another batch of logs completely ruined. I swear, these bears have it out for me." Gwilin: "I hardly think the bears are clever enough to hold a grudge against you, Miss Temba." Temba: "When I want your opinion, I'll ask for it. Otherwise, mind your business." Temba: "Gwilin! I told you to cut those boards at twice arm length! My arm's length. Not yours." Gwilin: "I'm so sorry Miss Temba. Perhaps if you would have been more specific..."
Temba: "Sigh. Everyone isn't as short as you are... what good are these boards to someone of the proper height!?" Grin and Bear It: Give ten bear pelts to Temba Wide-Arm. This page was last modified on 19 December 2013, at 21:37.